It is turning REALLY chilly. I have soup on the brain…again! But I also have yummy fresh fall produce on the brain too. Gosh…can those two be related? Oh yeah! So true story. This morning leaving for work I catch a glimpse of a big butternut squash sitting on the kitchen table (I always have a platter of fresh fruits and veggies on the kitchen table ready to go). I hung on to that thought. Once I got to work the thought of that big flavorful squash was pushed from the front to the back of my mind while I concentrated on work, but it was still there. I really had food on the brain, and that was going to make its way out to a yummy dinner for my family. I kept thinking…what could I do with that squash? Then it struck me. I had some beautiful lump crabmeat in the fridge to use up too, and I was determined to get those two things together. Denis has been talking about making soup lately, and any soup he ever makes is fabulous. Hey, how about soup with butternut squash and crab? Yes! that was it. I thought my head would explode because it sounded so good (plus I’d had a tiny breakfast and was hungry!!). I texted Denis. I knew one text would hook him on the idea too. And it did. I walked into the house after work. Even thought my dog was happy to see me and jumping around my ankles in joy at my return, I stopped dead in my tracks. I did not bend down and talk to her as I usually do. My head went back. My eyes closed. I breathed in deep. I knew instantly that Denis was there and cooking. It smelled amazing. I had to take it all in. The house smelled incredible. After a minute of taking the scents and aromas in, I gave my sweet dog some attention. Then off I went in the direction of the kitchen. Dinner was fantastic. Soup was perfect for that chilly night! What do you have on hand to make soup with tonight? 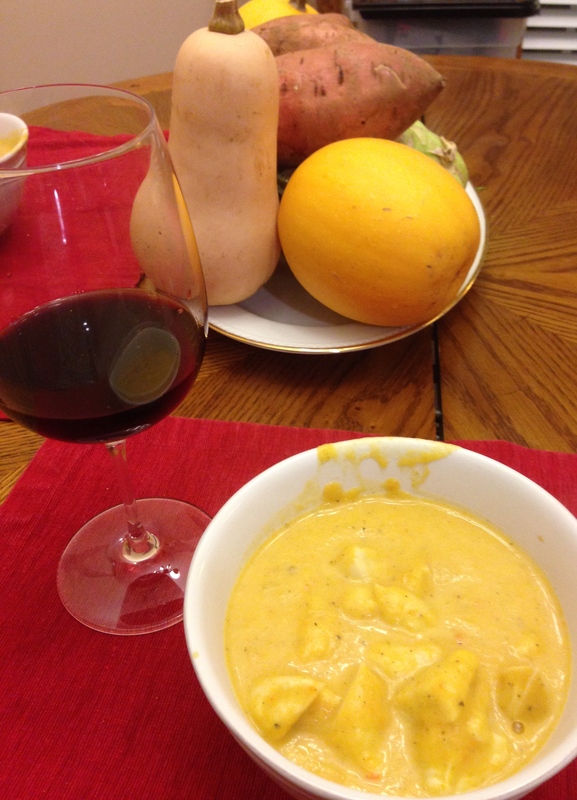 The butternut squash crab soup and a glass of wine made the perfect cold night dinner! See the beautiful plate of veggies on the table? It is great to be veg ready!